A referral has been made. A neighbour who overheard a child screaming in the night has called the NSPCC and now the child’s parents, frustrated by the interference, are using every excuse to avoid letting a social worker into the house. The child’s asleep, they explain, she’s been ill in the night. All the social workers assembled break off and laugh at this question’s familiarity. This is a role-play session, part of the training consultant social workers are delivering at Frontline’s summer institute. The fast-track social work training programme started this month with a five-week residential summer institute to prepare its 104 graduate trainees for a local authority work placement, but it’s not just the students here who are getting trained. The social workers who have agreed to take part in Frontline, by supervising a unit of the programme’s participants within their authority, are learning the programme’s model, which is based in systemic practice. Also known as the Hackney Model, or “Reclaiming Social Work”, it was pioneered in Hackney by current chief social worker Isabelle Trowler and former Hackney children’s services deputy director Steve Goodman. 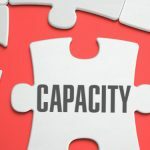 In the Hackney Model, cases are allocated to units of social workers rather than individuals, each headed up by a consultant social worker who manages the unit whilst remaining in practice. Trowler and Goodman went on to form consultancy Morning Lane Associates, which now advises Frontline on developing its training programme. Part of what makes Frontline unique in the world of social work education is that each participant will be placed in an authority within a Hackney-style unit, overseen by a consultant social worker to help them with their cases. Accommodating these units within participating authorities has required them to work in close partnership with Frontline. Taking on students with only five weeks of training under their belt, who will be working in a model not necessarily the same as the authority’s own, is a big commitment, but one that the Frontline believes will have big rewards in the quality of the social workers it hopes to produce. For many of the consultant social workers who have chosen to take part, managing a unit of Frontline students is an opportunity for career progression while remaining in practice. Henry Smith, a children’s social worker in Richmond upon Thames, sees participating in the programme as a way of engaging with both the academic world and with service users. Smith sees Frontline as an opportunity to redress some of the things he saw as lacking in his own social work education, including being told by his university that students would learn on their placement things that the placement organisations expected that they should already have learnt in university. In this model, he thinks, they will learn in five weeks “more than most first year students…probably more than some second year students”. “What they’re being taught is preparing them very well for being in the authority and I don’t envisage them needing more or less support than a normal student,” Henry says. However, there will inevitably be some resistance to a model different from the authorities’ own, and while the consultant social workers don’t want to dilute the Frontline model, it will have to mould into the existing systems in the host authorities. Suzan Ismail, a children’s social worker in Haringey, feels “there’s always going to be resistance when something new and potentially radical has been introduced, but most people are much more receptive now”. In Haringey there has been resistance across the board: from newly qualified social workers who want to know what’s wrong with the way they were trained, to more experienced social workers who feel that they are using the model’s techniques already and don’t need to adopt the systemic model formally. “There are lots of techniques I was already using but this has given it a name and taught me even more of the theory behind it,” says Ismail. “The idea in systemic practice is that you can ask certain questions that become the intervention in themselves. We’ve got into a habit as social workers of always referring so this puts the focus back on social workers doing that kind of work, being a change agent. In the face of criticism, a lot of work has clearly gone into Frontline’s image, from the video address to the cohort given by Prime Minister David Cameron, to the expertly orchestrated visitor tours. But students Colin Edwards and Natalie Williams are clear that the programme doesn’t shy away from opposing views about the programme, or within social work itself. Williams, a recent psychology graduate, adds that the Frontline students have had “plenty of people who aren’t exactly in love with idea” come and speak to them. Edwards and Williams got to Frontline by different paths, but both were drawn by the idea of learning in practice with the support of a team, and both have had opportunity in their personal lives to see the value of good social work. “This is really what I always ought to have been doing, but I didn’t necessarily believe I was capable of it when I was going into university,” says Edwards. For Williams, it was a placement in a low security unit for people with personality disorders and subsequent charity work with people with learning disabilities that got her interested in social work. Teaching the Hackney Model to the Frontline participants has been enabled by working with the organisation that came out of the model: Morning Lane Associates, which is currently training up consultant social workers to pass on knowledge of the model to the trainees. Karen Schiltroth, the company’s head of learning describes working with Frontline as “a pretty good gig”. “It’s been really exciting for us because we’ve all lived the unit experience and our own journeys of moving from traditional teams to units has been transformational for each of us,” she says. “The model is really about how you create a context which provides multiple perspectives to enrich a complex task and I think that’s a model that’s applicable in most situations. For Bedfordshire University professor Donald Forrester, the lead academic on the programme, Frontline will never be the only way that social workers get educated. Read a longer interview with Professor Forrester here. 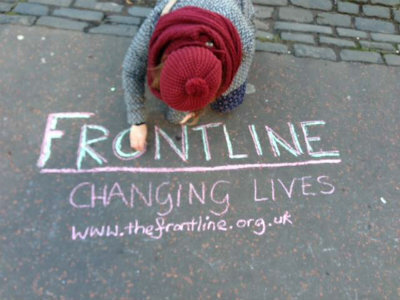 Two weeks in and no-one has a bad word to say about the programme – from within Frontline’s walls at least. The institute is off to a flying start, but the end result still remains to be seen. Its not so much the model that begs concern, rather the access into Frontline. Narey raised a similar concern regarding “Step Up” to my own about these initiatives, , i.e. that a life experienced individual with good academic qualifications proven career success to date could not use this route for lack of a degree. I personally called Frontline when considering a change of career to Social Work, and was advised this was a non negotiable. When I questioned the suitability of a 19/20 year old with a first in geography being considered more suitable than lots of similar individuals to myself, they replied, well yes – sorry that’s the criteria. I can understand and see the benefits in this approach, but the pool that can be fished is much broader, wider, and possibly committed to a career in social work than this limited academic approach. I am now a second year student undertaking the degree, but feel I could have benefited greatly from this fast track and it would have utilised my knowledge and skills more effectively, which in turn could have benefitted the profession with a qualified S/W sooner. There are many more mature individuals who cannot quite hit this criteria but who can admirably demonstrate capability. Perhaps that’s where this programme should move to next? Must agree with quotation” But where that ability can be demonstrated to the satisfaction of the employer, possession of an Upper Second or First should not be mandatory. Frontline should seek to recruit individuals the majority of whom are likely to stay in social work for a considerable time.” People who are dearly committed to social care work and want to progress to social work or mature individuals, should not be excluded or being prejudiced from tight entry criteria.